Where there’s smoke there’s fire whenever Sue Ellen binge drinks! 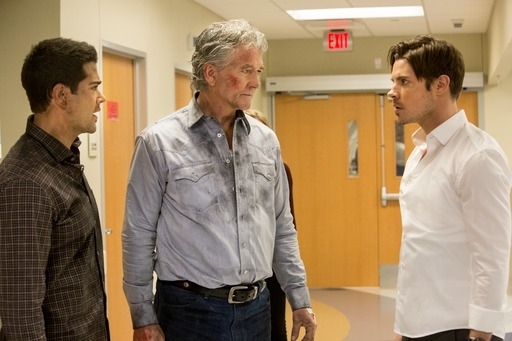 It’s deja vu for Bobby as he and Christopher arrive at Southfork to find it once again engulfed in flames. 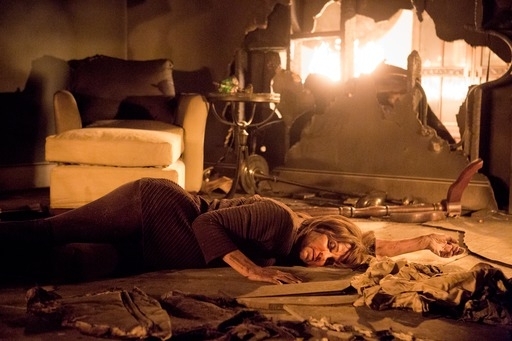 Like the last fire back in 1983, Sue Ellen is lying unconscious in the middle of the inferno. They find a badly injured Bo first and Christopher drags him out of the house while Bobby tends to Sue Ellen. As the Ewings escape their burning home, John Ross and Emma are joined at the site of their tryst by an EMT crew that whisks a non-responsive Pamela to the nearest hospital. The emergency room becomes a gathering place for estranged couples and former lovers as Elena comforts Christopher (just as Heather arrives with her little boy to take in the scene of Elena and Chris embracing, of course), John Ross rejects Emma and Ann keeps mum about being with Harris while Southfork was burning down, telling Bobby she was grocery shopping of all things. We all know how that little fib will come back to haunt her. When Bobby tells Ann about Pamela’s overdose, she berates Emma and demands she move out of Southfork. Not that anyone’s going to be living there for the time being, mind you. The Rylands are having their share of family drama, too, as Judith teases Harris about carrying a torch for Ann. He retaliates by insinuating that his dear old mom is no better than the whores she rents out at her brothel. When Mama Ryland drops by the hospital to collect her granddaughter, she spills the beans to Bobby about the kiss she witnessed between her son and his precious wife. Ann is caught once again withholding information from her husband and he’s none too pleased. Later, Judith encourages Emma to wallow in the pain of her rejection at the hands of John Ross so she can use it to fuel her inevitable plan for revenge against those who have wronged her. How John Ross can clean up his latest mess is anyone’s guess. Although Sue Ellen emerges relatively unscathed physically from her ordeal, her emotional state is another thing totally. She begins having partial flashbacks to the events leading up to the fire and fails to tell Bobby about her bender. She rejects her attending physician’s attempt to get her into rehab and yells at John Ross to get out of her hospital room when he tries to check in on her. His fling with Emma has rendered him radioactive among his family members. Bobby tells him to man up and just be a better man, if he can. When he visits a recuperating Pamela at the hospital, she rejects his attempt to apologize and shares with him she overdosed on purpose to sully his affair with the disturbing image of her pills-induced seizure. Ms. Barnes Ewing is clearly a gal who will go to great lengths to get her point across! Elena is slowly realizing that she’s been sleeping with the enemy. While she’s giving Christopher and John Ross support, Nicolas and his cronies in the Mendes-Ochoa cartel have succeeded in capturing her brother Drew, who paces in an interrogation room at an unknown location. Elena learns from John Ross that Pamela’s overdose was provoked by a video of him with Emma that was texted to her. Although John Ross is convinced Harris Ryland did it, Elena comes to the chilling conclusion that it had to have been Nicolas who did it. Sue Ellen makes a startling discovery of her own when her flashbacks reveal that she had set fire to an invitation to John Ross and Pamela’s wedding during her drinking binge. Convinced that she was responsible for the fire, Sue Ellen stops herself from nearly ingesting aftershave lotion from the hospital’s pharmacy and confesses her guilt to Bobby, Ann and Christopher. She admits that she remains, and will always be, an alcoholic. Back at Southfork, Bobby asks Ann for room to contemplate how he can forgive her for her latest deception. Christopher feels like the odd man out as he witnesses Bo bond with his son and Heather at the hospital after his spinal cord surgery proves successful. When we next see Nicolas and Drew, we learn that Sue Ellen’s confession about setting the fire was all for naught. It was Drew who actually started the blaze in retaliation for the Ewings’ sins against his father. Nicolas is unsuccessful in convincing Drew to drop his vendetta and allow his plan with Elena to take hold so the cartel can take over Ewing Global. Drew wants no part of Nicolas’ plan and is executed as Nicolas watches. Will Elena be next?